Modernity allows us many options previously thought impossible. Plants, for instance, once grew in season as the climate allowed. Canning and preserving fruits and vegetables are old-fashioned (yet still practiced) arts that stemmed from this seasonal reality. Yet the capacity to control and adjust internal temperatures through heating and air-conditioning changes everything. Modern indoor crop raising is now common and its applications are suitable for farms, nurseries and homes. In fact, all kinds of flora grow under shelter from seed-time to harvest. Key to growing vegetables in a greenhouse are information, preparation, observation and discernment among diverse and developing crops. 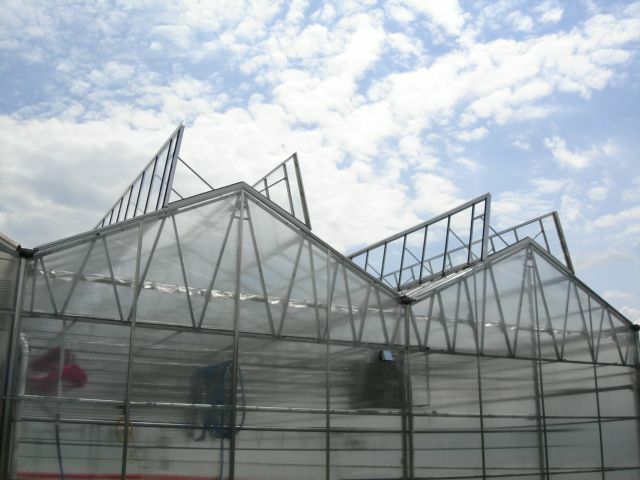 The types of frames and panels used for growing vegetables in a greenhouse are important factors in the success of your venture. Much of the decision-making hinges on the gardener’s purposes. Some greenhouses are strictly for husbanding seedlings prior to outdoor transplant. Others serve to harbor cold-sensitive vegetables like french beans in the early spring. Still others house crops that thrive in the heat, like watermelons and sweet potatoes. Since green plants rely on light for photosynthesis and development, access to it is paramount when growing vegetables in a greenhouse. Older plants demand more light than their younger counterparts. Overlapping leaves of adjacent plants might point to the phenomenon of “stem-stretching“. This elongation is a sign that some leaves are receiving insufficient sunlight, calling for gardener intervention. This is why regular observation is so important. Even when the greenhouse itself is bathed in generous sunlight, individual plants can suffer because of a lack of spacing among them. The desire for a robust indoor harvest must be balanced by a resolve in favor of healthy, quality vegetables. At the same time, some flora grows well by means of artificial light. High-pressure sodium lights and metal halide lights also accommodate the photosynthesis process. These devices are useful for the reproductive, fruiting stage of “long day” plants. While plants can not suffer from a plethora of sunlight in and of itself, they can endure damage from the sun’s heat. True, as noted above, some species thrive in the hot houses. Tomatoes, peppers and eggplants, for example, do very well in high temperatures. As long as baseline moisture remains, gardeners need not worry about growing vegetables in a greenhouse…not these vegetables, anyway. Still, species of mushrooms, herbs and leafy greens grow best in cooler environs. One way to take the edge off the hot summer months is excellent ventilation (see below). Yet when outdoor temperatures are oppressive, its utility is limited. A more intrusive way to cool a greenhouse is the use of mist or fog, which actually absorbs heat from the internal atmosphere. This option calls for a somewhat costly infrastructure. More economical are chemical shading compounds spread over the glass or plastic paneling, letting in light but dousing the heat. Simply, ventilation is the continuous displacement of inside air with outside air. It is crucial when growing vegetables in a greenhouse. As the above paragraph indicates, temperatures within remain stable when ventilation is ideal. This is true in cold weather as well as warm. If a heated greenhouse does not enjoy proper air circulation, the stultified atmosphere inside will grow too humid with condensation and mold as the result. By pulling in and heating outside air, ventilation systems preclude these undesirable consequences. Ventilating is especially important in the summer as it filters out solar radiation. Many with experience in growing vegetables in a greenhouse prefer parthenocarpic varieties. These veggies grow without the benefit of fertilized ovules. Accordingly, mature plants contain no seeds whatsoever. What makes them perfect for greenhouse horticulture is the fact that such vegetation requires no pollination at all. It follows that these types can grow year-round indoors without needing fertilizing agents like bees. Of course, air, light, space and temperature all affect soil condition in the pots, troughs and beds of the greenhouse. Potting soil for best indoor growth can be a mix of loamy garden soil and compost. Alternatively, a composite of those components and peat moss also lends itself to vibrant vegetable growth. Manure, ash and bone meal – in varying amounts – work to supplement the organic matter of the potting mix. Another excellent aid is to clean out the greenhouse and replace the soil on an annual basis, usually in the summer. This rids the growing containers of residual pests and molds. Given the barrier between greenhouse vegetables and the heavens, tending to water needs is another important obligation. Unfortunately, there is no programmed schedule for watering that works in the confines of the green house. Therefore, regular monitoring and individual applications are necessary to prevent plants from drying out. When the soil surface feels dry to the touch, it is time to irrigate generously. Otherwise, let the veggies be – a simple, but demanding – irrigation regime. As is evident, each tip requires tweaking when applied to a particular vegetable. In addition, the size and diversity of the greenhouse will affect the gardener’s planting decisions. Meanwhile, we can never forget that location and climate have a role to play even with indoor horticulture. All this translates to learning as much as you can; spending as much time as you can in the greenhouse; and engaging in trial and error from time to time. After a few years of diligence, your greenhouse vegetables will be well worth the extra effort. Hey Buddy!, I found this information for you: "7 Tips for Growing Vegetables in a Greenhouse". Here is the website link: https://backtofarm.com/growing-vegetables-in-a-greenhouse/. Thank you.